This is a simple modification of the original Radar disc inside the game (Which is lame) that changes it into a better looking one. oh, Which versions should I improve? Nice work, exactly what i need! OK i know... now ... who are moderators?? ok, it's been a while now and I noticed that the version A has been downloaded the most, meaning that it is more atractive than the other versions. But, It actually never appealed to me personally... it bugs me. 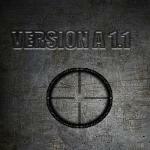 So, because it has been the most downloaded version, and I was kinda bored, I decided to release a more fresh design based on Version A called "Version A 1.1". Thanks again.